We all know of a roadside diner that serves up a specialty, which is an experience all on it’s own. Some places are known for their chili or sliders, while others focus on a specific side dish. It seems like most places find at least one menu item that becomes synonymous with their name. 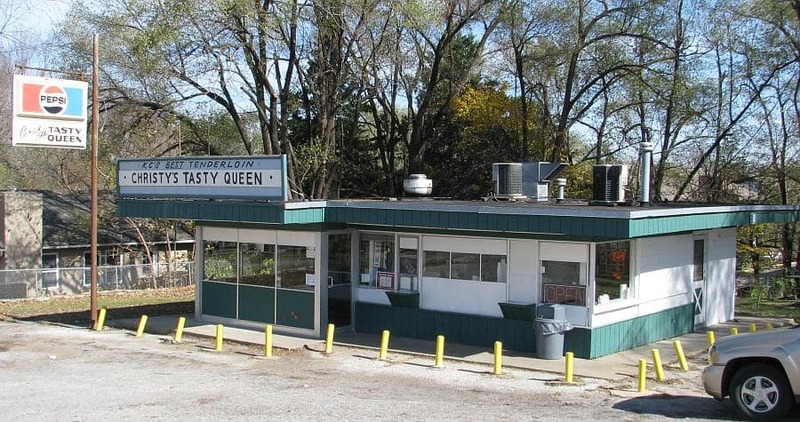 The same can be said for Christy’s Tasty Queen, located at 1405 S 55th Street in Turner, Kansas. This diminutive stop beckons diners with fresh fried menu items, and cold sugary treats. It is also home to a tenderloin sandwich that has a following of it’s own. On any given day it would not be unusual to be greeted by the owner. The family is very involved in the local community, and you will often see flyers for various fundraisers and events plastered to the windows. Seating at Christy’s Tasty Queen is not a problem, as there is none on the inside. On the outside you will find a picnic table, but most people choose to eat in their cars or take the food to go. During the lunch rush this place can be a madhouse, as people flock here from the local businesses and schools. 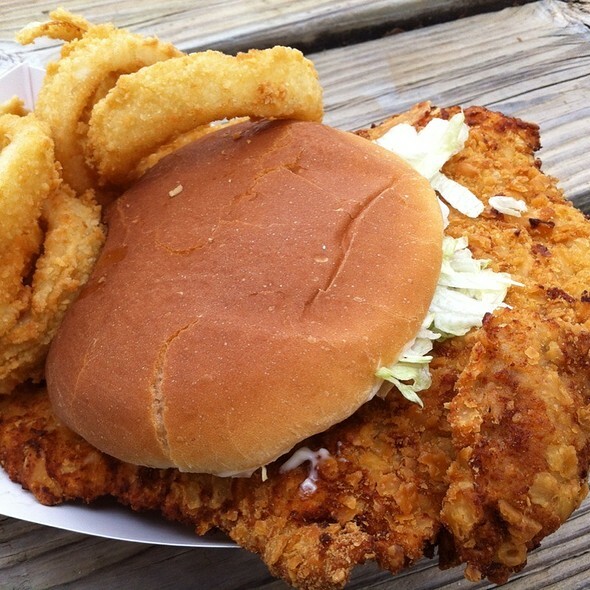 If you ask a regular at Christy’s Tasty Queen what the specialty is, the answer would probably come out, the pork tenderloin sandwich. This sandwich has a bun that is about 5″ across, but it is dwarfed by the huge breaded slab of meaty goodness. It takes a strategic plan to attack this sandwich, and many find themselves having to divide to conquer. When coupled with fries, or better yet onion rings, this combination will satisfy all but the most hearty of appetites. Add a thick, creamy shake and you have a lunch that will create envy among your co-workers. Christy’s Tasty Queen carries an assortment of other finger ready foods. Most are not anywhere near the realm of health food status, but the food is very flavorful. They open at 10:00 am on Monday through Saturday, and close around 7:00 pm, except for their 3:00 closing time on Saturdays. They are not open on Sundays, which is probably spent devising their next delicious menu addition. So why not drop by our neck of the woods, and give them a try. We think you will be hooked. Such a great place! The Tenderloin to die for. Also the Italian steak is wonderful. Thanks for posting about it. Go there at least once a month. Glad you enjoy it, Pat. It is certainly a KCK classic. Thanks. We are really enjoying all of the new found freedom that it offers. It is also forcing me to become a better writer. Thank you Jeff, that was awesome. I really appreciate you writing such a nice article. I think we owe you and Crystal a tenderloin! I’m glad you liked the article. It seems to be well received, which tells us that many people love your restaurant. Keep up the great job. How true, although there are still some to be found with a little research. That is why our blog tries to include some of these smaller businesses. They are just regular people trying to make a living doing something they love. The list goes on and on. Thanks for the comment. You are welcome. We look forward to your next visit. Yes, they are some of the best around. Yes it is. We stopped by today, and the same good food as always. The tenderloin is THE BEST! So are the cherry limeaides! Spot on. Of course don’t forget the shakes. We hope you find in in person, and let us know what you ordered. WHAT A PLACE. GREAT FOOD FOR AS LONG AS I CAN REMEMBER. SERVICE IS EXCELLENT. Glad you are a fan of them. Thanks for the comment. It’s been a family tradition For the Neal’s !